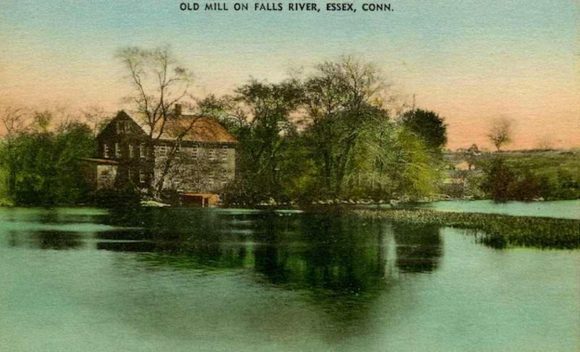 A colorized postcard, circa 1910, shows the sawmill, dam and mill pond, part of the Williams Complex & Shipyard, which once stood at the mouth of Falls River Cove. Photo courtesy of Essex Historical Society. ESSEX — Celebrate the history and natural beauty of Falls River Cove area with a riverside soiree and clam bake, hosted rain or shine by Essex Historical Society and Essex Land Trust, held at Osage Trails Preserve, Foxboro Road, Essex, on Sunday, June 3, from 4 to 6 p.m. Learn about the groups’ major collaborative partnership, investigating the Williams Complex & Shipyard, 1689 – 1845, ‘hidden’ below Falls River Cove for 150 years. Osage Trails is as close as the public can get to the site of the former shipyard, now on private property. 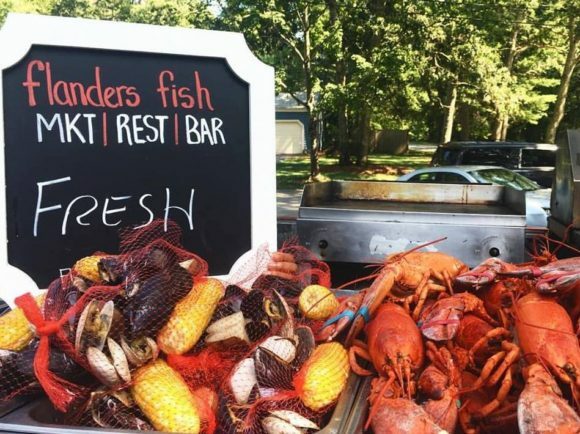 The Clambake will be catered by Flanders Fish Market. 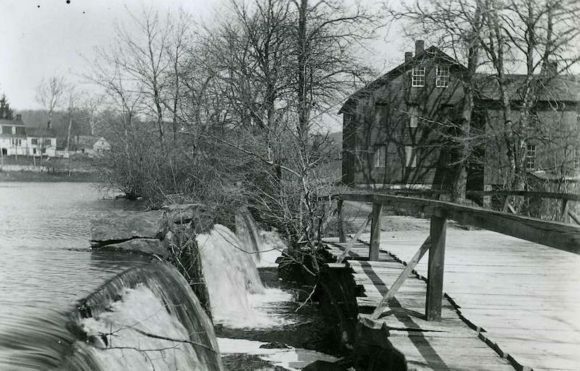 Follow the Falls represents a joint effort by Essex Historical Society and the Essex Land Trust to tell the remarkable story of the Falls River, which binds together the three historic villages of Ivoryton, Centerbrook and Essex to form what we know today as the Town of Essex. Besides its historic significance, the Falls River is home to a rich natural history, kept alive by the four Essex Land Trust preserves located along its winding shores. In 2018, Follow the Falls explores the area’s natural history, Native American and European settlements, the harnessing of the river’s water power and the industrial development of Falls River Cove. and the industrial development of Falls River Cove. A triple-spillway dam at the mouth of the Falls River, once powered several small industries in the 17th, 18th and 19th centuries. A wooden bridge connected the river banks between a grist mill and the sawmill, as in seen in this late 19th century photograph. Photo courtesy of Essex Historical Society. Thanks to new technology, a 24-page booklet and conversations with research participants, attendees can look through this window into the shipyard’s history. See how local resident and environmentalist Diz Callender’s vision was realized as she donated this beautiful parcel to form the Osage Trails Preserve with its rich natural history. The ongoing project is made possible with support from Overabove, the Community Foundation of Middlesex County and Guilford Savings Bank, as well as private funders. The Follow the Falls Celebration and Clambake will be catered by Flanders Fish Market. Photos courtesy of Flanders Fish Market.